Ali received his Bachelor of Science degree from Indiana University with a focus on accounting in 1992. He then started his career with the international accounting firm of Ernst & Young LLP, where he stayed for five years and earned his CPA designation. 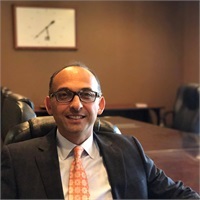 Subsequently, Ali joined Fred in the financial consulting practice in 1997 to pursue his passion of making a direct positive impact in clients’ lives through financial planning. In the years since, Ali has used his education and experience to help clients plan for retirement, education funding, estate planning, and any other financial goals they may have. Ali also specializes on servicing qualified retirement plans for small to mid-size companies throughout the country. He enjoys the fact that many of his clients have become great friends and is honored that they have referred friends and family members to him over the years. In his free time, Ali enjoys playing tennis, racquetball, basketball, cycling, hiking, and generally anything to stay active! He also enjoys travelling and spending time with friends and family. He also has served as board member and volunteer for various charitable organizations in the community.